Gelada monkeys live only in the high mountain meadows of Ethiopia—an environment very unlike those of their forest- or savanna-dwelling primate relatives. This high-altitude homeland is replete with steep, rocky cliffs, to which geladas have adapted. At night, the animals drop over precipice edges to sleep huddled together on ledges. These baboon-size animals are the world's most terrestrial primates—except for humans. As grass-eaters, they are the last surviving species of ancient grazing primates that were once numerous. Geladas spend most of their day sitting down, plucking and munching on grasses. Theropithecus gelada live in small family units of one male and three to six females. 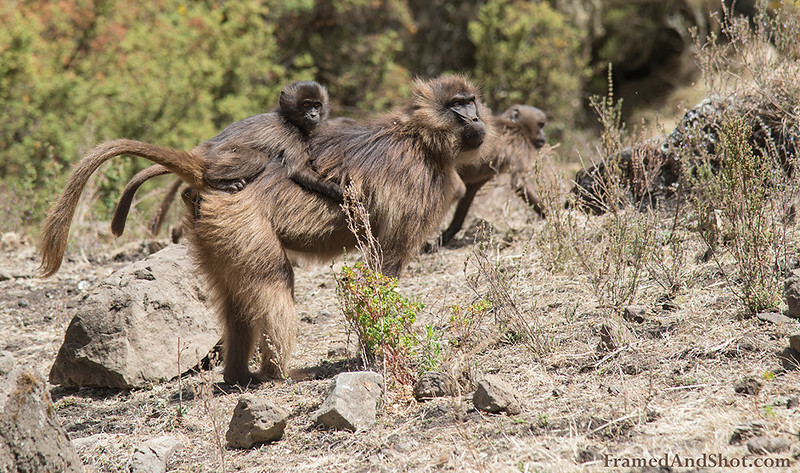 Gelada family units often combine to form large foraging bands of 30 to 350 animals. When food is abundant as many as 670 geladas have been seen together.